The signing of a document written after 3 years and 3 months of talks, Colombians are looking for great changes, and after 52 years of murders, forced migration, kidnapping, and extortion this was what this Latin American country was known for. Colombia’s government with Juan Manuel Santos as president of the country and Rodrigo Londoño (better known as Timochenko) as the leader of the Revolutionary Armed Forces of Colombia FARC are meeting today in La Habana, Cuba, this has been the place where this process first started, initially as a campaign proposal, and then it became real during the second term of Santos as leader. Some Colombians, who are skeptics of the process, still do not believe in the good will of the Farc, while others think that this is a real step toward not only talking about peace but living it. To be able to go across the country from town to town, and not be afraid of becoming a victim of kidnapping, or a family member being ransomed by extortionists , to leave the country and be proud to say “I am Colombian and I live in a beautiful and safe country that anyone can visit an enjoy”. In the last 52 years 23 zones were controlled by the FARC, the guns they owned will be surrendered to the United Nations Organization over a 180 day period, and within the first 60 days all explosives a heavy artillery guns will be relinquished, the weapons will be melted down and made into 3 different monuments. Even though today Colombia is signing this peace agreement it is clear that the expected peace would not happen immediately, the terms and conditions of the agreement are still being worked out. 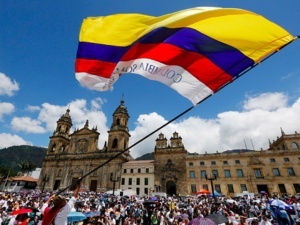 For now Colombians are celebrating this big step and are praying for peace.